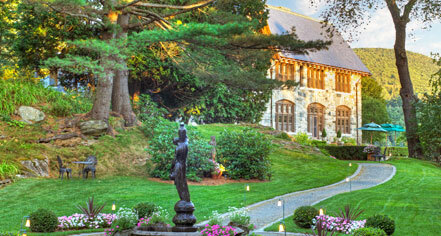 Nestled among the majestic beauty of Vermont’s Green Mountains is the luxurious Castle Hill Resort and Spa. With the exceptional Okemo Mountain ski trails in the front yard and an abundance of year-round adventure and pampering options all about, this historic Vermont hotel delivers breathtaking views and activities throughout the year. 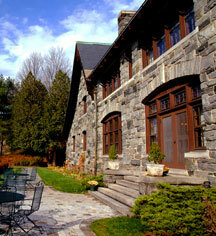 Regardless of the season, a visit to Castle Hill Resort and Spa involves magical experiences and adventures. Winter transforms the region into a snowy wonderland. This creates an ideal destination for cross-country skiing, downhill skiing, snowboarding, ice skating, and sledding. As spring and summer emerge, the entire area is bustling with activity. From arts and crafts to jazz and golfing, there’s something for every adventure seeker. For those who wish to be mesmerized by a vibrant kaleidoscope of colors, the transition of the fall leaves in the Northeast should not be missed. The landmark Castle Hill Resort and Spa combines gracious hospitality with a scenic, rural setting and the finest in modern amenities. European craftsmen worked for five years to create the elaborate details that give the inn its authentic old world ambiance. The award winning Aveda Concept Spa, nearby historical and cultural attractions, shopping, and antiquing are additional great reasons why this historic Vermont hotel is the perfect getaway. European craftsmen worked for five years to create the eleaborate details that give the inn an aunthtic Old World ambiance. Cancellation Policy: If a cancellation is made more than 14 days prior to arrival, we will refund 90% of your deposit. If a cancellation is made within 14 days of arrival, the deposit is forfeited. Cancellations made within 48 hours of arrival (4pm), late arrivals, and early departures are responsible for the full value of the original reservation. Deposit: All reservations require a credit card deposit of 50% of the total stay with a 1 night minimum charge. Shuttle Service: Ski shuttle service to and from Okema Mountain Resort is complimentary. Learn more about the History of Castle Hill Resort and Spa .